Rogue antivirus programs have become more prolific as the need to keep our data secure grows. These programs use the desire to keep data safe and our systems running in optimal condition as a way to persuade us to buy expensive and useless software. Recognizing rogues like Security Master AV is the real key to keeping your computer secure. What is Security Master AV? Security Master AV is a typical rogue antivirus program and is related to My Security Engine, Security Guard, CleanUp Antivirus, and Virus Doctor. While these programs go by different names, the goal is the same: to create the illusion of security threats if you do not buy their software. It is important to stress that not only do these rogue programs provide absolutely no protection; they actually create the "security issues" that you are experiencing with your computer. 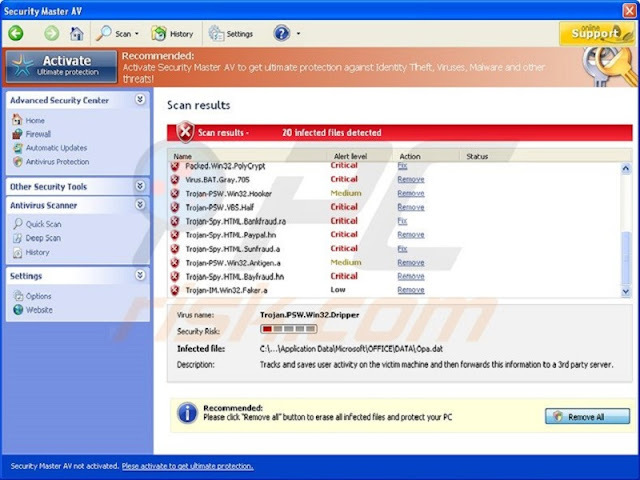 System alertSuspicious software which may be malicious has been detected on your PC. Click here to remove this threat immediately using Security Master AV. False security scans are also very common. These are designed to mimic those from legitimate security programs so make sure to scrutinize each message before taking action. You will see the Security Master AV name in the top left corner, along with urging to install this program to protect yourself from identity theft and viruses. The false scan indicates that threats have been found, and your firewall, automatic updates, and antivirus protection are turned off. If you see these pop-ups, do not click on them. Close them using the task manager. You will also notice that your computer runs much slower and that your browser settings are changed. You will be redirected frequently to rogue sites and urged to purchase Security Master AV. Security Master AV depends on Trojans to find its way into your computer. Certain "questionable" sites are known for harboring Trojans, including those with adult, free and shareware, gaming, trending, and social networking content. Clicking on an ad, banner, image, downloading a video, or even simply clicking on the site can be enough to allow Trojans in to deposit a "free version" of a rogue program. The "paid" or full version of this rogue is installed directly by the user. After seeing pop-up after pop-up warning of security threats, it is understandable that we want to act to protect our systems and our data. Unfortunately, those who buy Security Master AV find that the issues they have been experiencing continue and that other forms of malware can enter through security vulnerabilities created by the rogue. Whether you have the "free" or "paid" version, which are identical and equally useless, it is important to take immediate steps to remove Security Master AV so your data and system remain secure.